The animation from Slap Happy Cartoons premiered on the UK channel in April. 9 Story Entertainment has licensed Slap Happy Cartoons’ animated comedy, Nerds and Monsters to CITV. 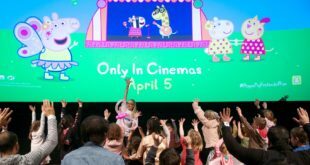 The animation was premiered on the UK children’s channel in April as part of its weekday afternoon line-up. Nerds and Monsters follows the adventures of three nerdy kids and a football star as they explore an unchartered castaway. The castaways must use their intelligence to survive the island and its tribe of hideous monsters. The show was previously licensed to ABC TV Australia and premiered in March on YTV in Canada. Slap Happy Cartoons works with a global base of clients including Comedy Central, Kids WB, DHX Media and Disney XD.